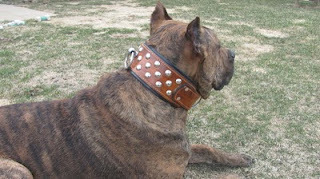 The usual size of the Schweitzer collar is 4 inches wide, but as requested by a customer I have tapered it down to 3.25 inches. I will incorporate this dimension into the collection for some diversity. As shown this is a double ply 18 oz leather thickness, light brown on black latigo leather backing. Round nickel spot rivets with antique brass lion head with back plate. 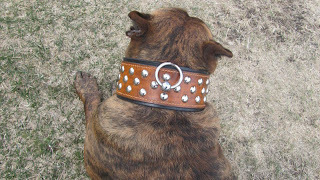 As with all my collars, durability, strength, and function are the most important aspects.